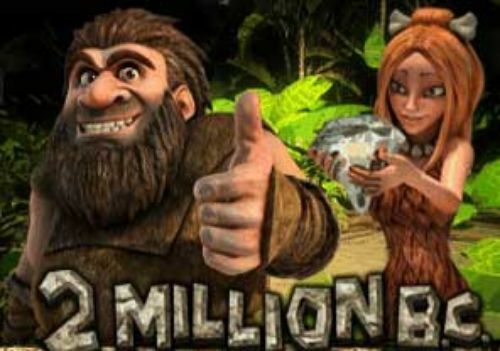 Microgaming produced Agent Jane Blonde slot and little did they know, it took off and became one of the games in most online casinos. It features an Return to Player theoretical outcome of 96.10%, three rows and five reels. There are ten selectable paylines and picture-only symbols. 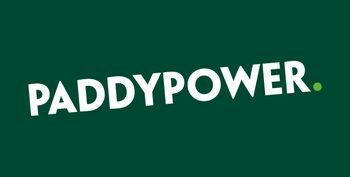 The smallest bet that the players can make is just 9 pennies and the biggest 45 pounds. 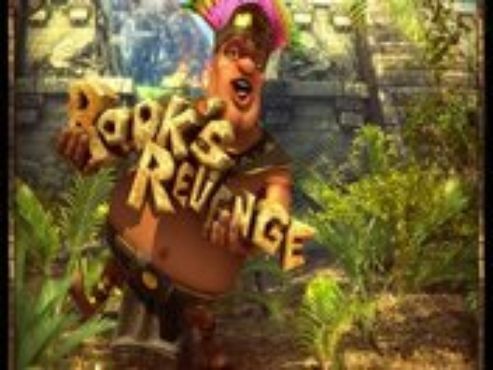 All this for a possible win of 10,000 coins and a free spins bonus feature. Agent Jane Blonde slots is a five-reel, nine paylines online video slot from the Microgaming software development company. This video slot machine makes use of an interesting theme giving you a glimpse in the life of the agent Jane Blonde. With a few bonus features like Free Spins, Agent Jane Blonde Wild, and a Gamble Feature, you can spin the reels of Agent Jane Blonde slot hoping to win the game’s jackpot of 10000x your total stake. 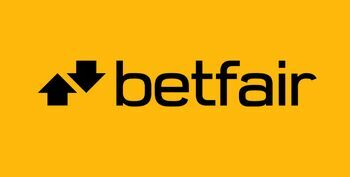 With the limits for the bet per spin set at £0.05 and £90.00, the game is suitable for players of all kinds. Agent Jane Blonde slot advertises an RTP of 96.10%! As mentioned in the text above, Agent Jane Blonde slots is an online video slot that uses an interesting theme showing the activities of the secret agent Jane Blonde. The five-reel, three rows, and nine payline reel set is set against a simple blue background with the game’s paylines given behind the reels. The game’s logo is placed between the reel set and the game’s buttons. 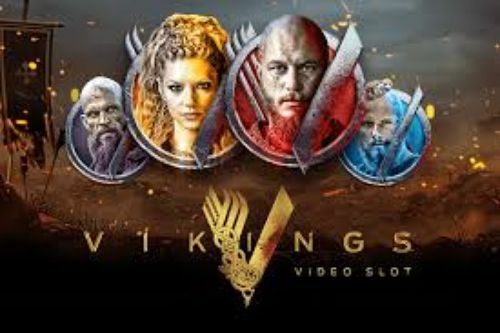 As with many online video slots, the buttons are positioned at the bottom centre of the screen and marked well. When the symbols on the reel set of the slot are in question, Agent Jane Blonde slots doesn’t feature playing card symbols like most slot games. Instead, all symbols found on the reels of the game are on-theme symbols representing either Agent Jane Blonde performing different tasks or items that she uses. The group of low-value symbols on the reels of Agent Jane Blonde slot includes six items placed on a white background. These items include such spying gadgets as x-ray vision sunglasses, explosive chewing gum, a cocktail shaker with a martini glass, a wrist computer, Agent Jane’s red lipstick, and her Derringer gun. The items are listed in ascending order starting and all symbols award payouts for combinations of three, four, and five matching symbols. The only low-value symbol that awards payouts for two, three, four, and five identical symbols are the x-ray sunglasses. The group of high-value symbols consists of five on-theme symbols representing Jane Blonde in different outfits. 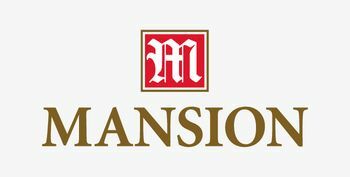 The lowest-paying symbol is Jane in a winter outfit, followed by her in a red evening dress, in a diving suit, next to a race car, and the highest paying symbol is agent Jane Blonde holding a gun with a silencer. 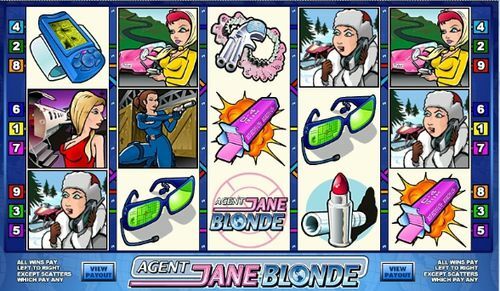 There are two additional symbols on the reels of Agent Jane Blonde slots that include the portrait of Jane as a Wild symbol and the game’s scatter symbol the Agent Jane Blonde slot logo. 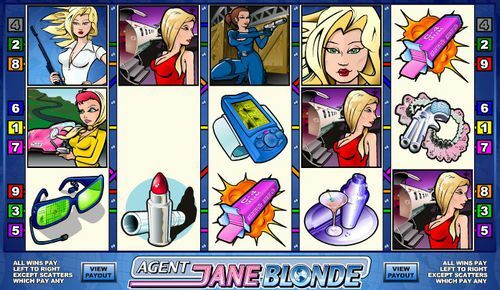 When it comes to playing Agent Jane Blonde slots, you will find it very straightforward since all buttons in the game are placed at the bottom centre of the screen. Before spinning the reels of Agent Jane Blonde slot, you need to set your total stake for the spins. This can be done by adjusting the lines and coins variables, as well as the coin size. You can set the number of lines either by pressing the blue ‘Select Lines” button or by selecting the number on the sides of the reel set. To select the number of coins that you want to place on a payline, you need to press the blue ‘Select Coins’ button. You can place anywhere between 1-6 coins. 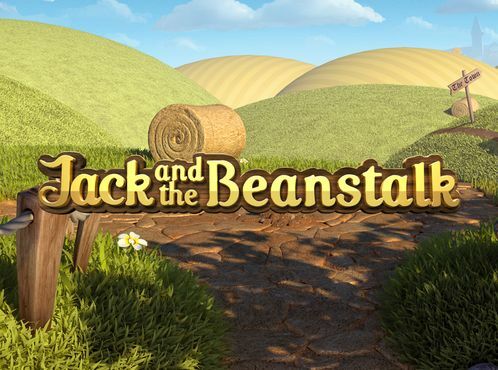 The game has nine coin-sizes that include £0.01, £0.02, £0.05, £0.10, £0.20, £0.25, £0.50, £1.00, and £2.00. 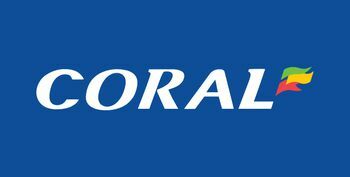 When you combine the three variables, you get the limits for the minimum and maximum bet per spin which are set at £0.05 and £90.00, respectively. Once you have set your total bet for the spins, you can set off the reel set of Agent Jane Blonde slots by pressing the blue ‘Spin’ button in the right corner of the screen. 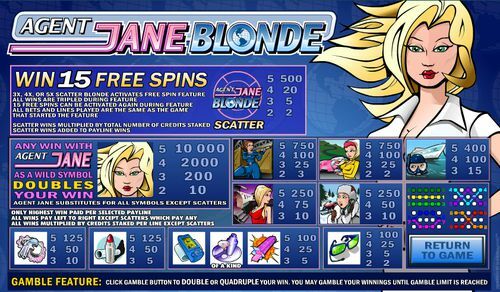 As with most online slots, winnings in Agent Jane Blonde slots are awarded for landing symbol combinations on the reels. The lowest payouts in the game are awarded by the low-value x-ray sunglasses with 2, 5, 25 and 100 for combinations of two, three, four, and five matching symbols. The highest payouts in Agent Jane Blonde are awarded by the Agent Jane wild symbol with 10, 200, 2000, and 10000 for combinations of two, three, four, and five matching symbols. To trigger this bonus feature, you need to land three, four, or five of the Agent Jane Blonde scatter symbols. 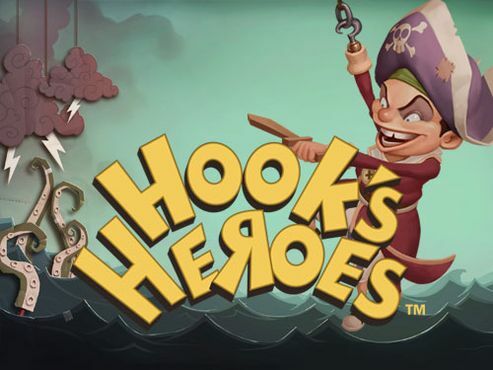 You’ll receive 15 free spins and all your wins in this round will be tripled which makes this round more than profitable. If you manage to land a win in base gameplay which includes the Jane Blonde wild symbol, you will receive a 2x multiplier accompanied by an animation of Jane Blonde in a white catsuit. You can gamble your most recent win in Agent Jane Blonde slot by pressing the ‘Gamble’ button below the reels. Here you need to predict either the colour to double your win or guess the correct suit to quadruple your win. You can collect the amount at any point, but should you choose wrong, you will lose the total win and go back to the base game empty handed. Agent Jane Blonde slots is another excellent Microgaming release which is similar to other of their releases. 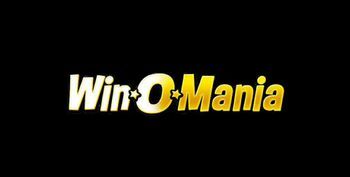 The slot has excellent on-theme symbols that may seem a bit dated but can still get you nice winnings. If you are a fan of the secret agent genre of slot games, then you should definitely give Agent Jane Blonde a try. The game advertises an RTP (Return to Player) rate of 96.10%, which is more than enough to list Agent Jane Blonde as an above-average RTP slot.